Hello and welcome - I appreciate your visit to my page! While my counseling approach is not specifically or exclusively Christian or pastoral, my faith informs everything in my life, including my work. I see counseling as a collaboration between client and counselor - clients want to feel their best and function at full potential, and my role is to provide quality, customized care to help them do that. I am a big believer that even small changes can significantly impact internal well-being and external influence. I partner with clients to identify and build on strengths so they can face challenges, create solutions, and feel better. 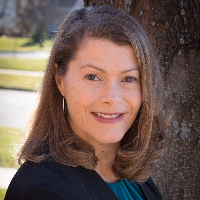 Licensed in Illinois and Connecticut for more than 15 years, I have worked as counselor, consultant, trainer, and advisor in both higher education and private practice. Much of my work has been with clients in transition. Change can be hard, and people who ask for help as they face it are brave. With an approach specific to each individual, consisting of a personalized set of strategies drawn largely from humanistic, cognitive behavioral, and solution focused theories, I support and encourage clients as they work to adjust to new roles, situations, expectations, and realities and help them cope with the resulting symptoms and feelings. I can only do this, though, through Him who gives me strength. (Philippians 4:13) Small groups of faithful women and learning from teachers like Beth Moore, Lysa TerKeurst, Priscilla Shirer, and Lisa Harper have been integral to my faith development. I regularly ask for the Lord’s presence in my work, which I enter into with a humble and grateful heart. Paul's message is not that challenging experiences are or ever will be easy; but, I find comfort in his reassurance of God’s protection and peace through Christ. It is a blessing to get to help clients work through a difficult time as they progress through life’s inevitable changes, and I would be honored to work with you! I’ve loved my experience with Aili! She is a wonderful therapist who makes me feel seen and understood. She has helped me through the hardest months of my life and I walk away from each call or message feeling really good! Would you like to write a review for Aili Wachtel? We'd appreciate if you can spend a couple of minutes to write a short review for Aili Wachtel (MS, LCPC). This review would be shared with Aili Wachtel. It may also be posted in our website or in Aili Wachtel's profile but it would be anonymous and your identity would be kept completely confidential.